I first met Kara Perez about a year ago when I interviewed her about her business, Bravely, for Movers + Makers. And I’ve admired what she’s been doing ever since! Bravely is a community that empowers and educates women about their finances through events and online content. Through Bravely, Kara is tackling a subject that creative entrepreneurs, especially those who are just starting out, need to know more about. 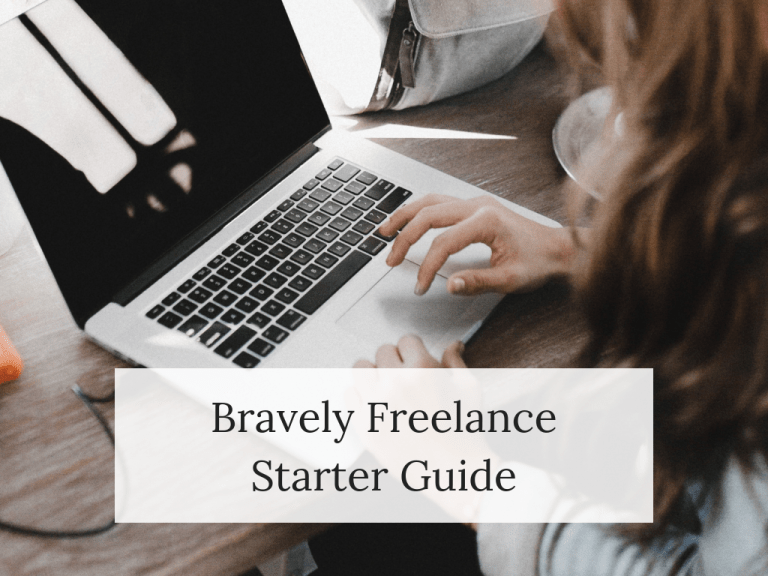 One of the products that she just released is one I’m super excited about: the Bravely Freelance Starter Guide. If you’re currently freelancing or considering diving into the freelance world, this guide takes you through every step of the process. And while I love a good inspirational story, this guide is full of detailed and transparent advice that highlights the financial side of owning a business. From the necessary steps like forming your business and organizing your finances, to practical advice like landing clients and creating invoices, think of this guide as an all-in-one resource for everything freelance-related. Here are a few takeaways from Bravely’s Freelance Guide that I found useful and that any aspiring freelancer can learn from. Getting an idea of where to even begin when pursuing a new business is one of the main topics we like to discuss on Movers + Makers. And this guide is no different when it comes to pursuing a freelance career. Kara outlines every step you need to take to get your business off the ground. This includes determining and setting up your business designation, setting up a bank account, and crunching the numbers to figure out what you need to keep your business (and life) running smoothly. While steps like figuring out whether you want to have an LLC or a Sole Proprietorship may seem intimidating at first, having a resource to turn to can make the process a lot less scary. One of the biggest obstacles that freelancers run into, especially at the beginning of their careers, is setting a price for their work and services. I know it’s something I definitely still struggle with! But figuring out how to price your work starts with determining what your desired income is. In the Freelance Guide, Kara goes over everything you need to factor in when setting your hourly rate. There’s even a handy formula you can use to plug in your desired income and crunch the numbers from there. Every entrepreneur’s favorite words to hear: quarterly taxes. Freelancers will pay quarterly taxes rather than the typical one-time deal. It’s an inevitable part of the job, so it’s best to be informed on every detail in order to prevent being blindsided by a big number come tax time. Luckily for us, Bravely’s guide details everything we need to know about freelance taxes like when to pay them, how to pay them, and (most importantly) how to save for them. This may not be the most fun part of being self-employed, but it’s definitely something that can’t be skimmed over. Staying informed and keeping track of every detail will contribute to your business’s growth and success over the years. These are just a few of the many things you can find in the Bravely Freelance Starter Guide. There are nine chapters and two videos that cover the freelance life from start to finish — all for just $65. Investing a little bit into yourself and your business today will prove to be more than worth it down the road.